Unfortunately, Solid Ground is ending its sponsorship of the Penny Harvest program on June 30th, 2014. Penny Harvest advocates are still looking for a new home for the program. Environmental stewards. Philanthropists. Community leaders. These are not usually titles we give to kids, even if the phrase “making a difference” is constantly pushed throughout school curricula. Is there a way that schools can facilitate the kindly intentions of students who are just at the beginning stages of a lifetime of learning? With the Penny Harvest program, one can truly call these little humanitarians, from kindergarten to 12th grade, bighearted superstars. 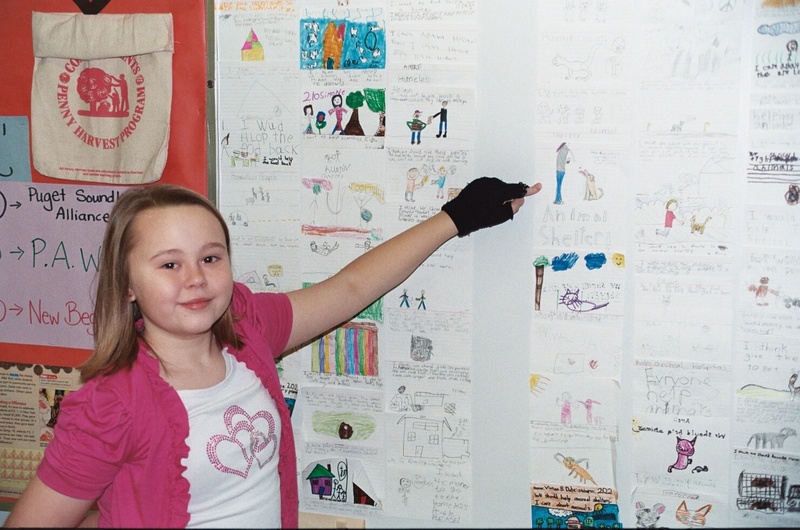 In 1992, Solid Ground (then known as the Fremont Public Association) partnered with Family Services (now Wellspring Family Services) and Atlantic Street Center to create Common Cents to teach area youth about homelessness through a spring coin drive paired with educational presentations. Around $40,000 per year was raised to serve families experiencing homelessness, all the while engaging thousands of students in philanthropic efforts. In 2005, the program became affiliated with the New York-based Common Cents and changed the name of the local operation to Penny Harvest. The model of the program also shifted from funding three specific organizations to allowing youth to select who and what to fund, and expanded to include a stronger focus on social justice work. Penny Harvest is now a national service-learning program engaging students between the ages of four and 18 in processes of philanthropy including gathering pennies, grant making and taking action as leaders in their community. The program introduces students to the power of giving and volunteerism, and thus they learn the right steps to drive change in their communities. Organizations that have received donations include everything from safe housing for youth and families, animal welfare, environmental justice to individual sponsorship of a homeless man in the neighborhood. This sort of energetic strategy can really get kids engaged, allowing them to experience the difficult, hands-on work it takes to fundraise. It also increases excitement around getting involved in the decision making process on where to allocate the funds, a task for which the students are 100% in charge. This sort of sentiment can be heard from students and adults alike. “Our main goal is that young people learn that they can and do make a difference at a very early age,” says Mike Beebe, former Penny Harvest Program Manager at Solid Ground. “Learning about community input, mapping community assets, community organizing. What we can do working together is so much more powerful than what we can do as one person. In some ways, I think that challenges the narrative in our country around individualism,” says Mike. Ana Lucía says that one of her favorite parts of the program was being on the Board. 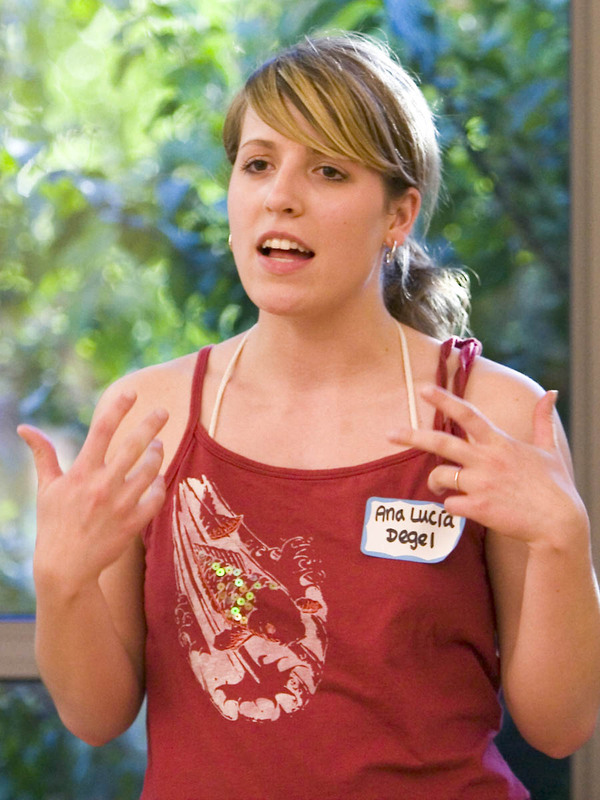 “I really began to feel empowered to make a difference in my community,” she says. The Board typically met every Monday and talked about the visioning and transitioning of the program, wrote and sent out appeal letters, and planned events like the Youth Philanthropy Summit. The Summit was always a special time of year. “This year we had about 140 students who came to the Summit. They got the chance to meet about 30 different organizations from across the city that do a wide variety of work and really connect with them on a different level,” explains Kathleen. After that initial meeting, students then workshopped and dug into the root causes of issues they care about most. “It’s really complicated and complex and compacted. It was really cool to see everyone from the 16-year-old Youth Board members to the kindergartners who were there,” says Kathleen. Sometimes it seems crazy to think that something as small as a penny could ever make a difference in anyone’s life. A piece of currency that has been, for some years now, considered almost unnecessary in our economy and one that is constantly on the verge of becoming obsolete. However, the mission of the Penny Harvest program is to turn one person’s inept coinage into a student’s philanthropic development that benefits the community. If you are interested in assisting Penny Harvest in finding a new host organization, please contact Common Cents through Mike Beebe at 206.354.7312 or mpbeebe@gmail.com. 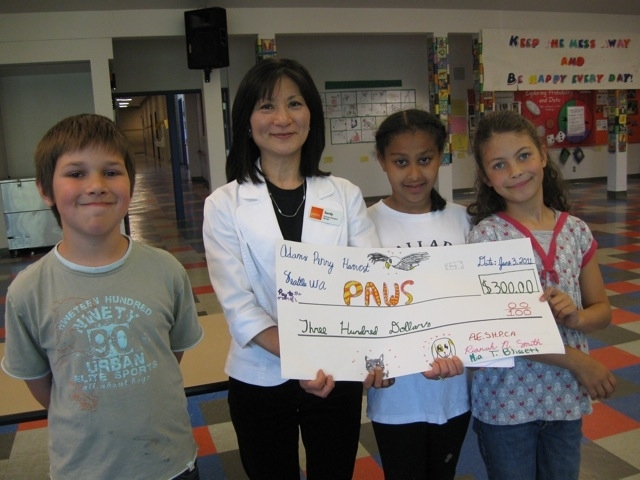 Penny Harvest Philanthropy Roundtable members from Adams Elementary School present a check to one of their chosen grantees, PAWS. On September 26, Youth Service America highlighted youth philanthropic efforts across the country. Solid Ground is excited that they recommend Common Cents Penny Harvest, the largest youth philanthropy program in the country. (Solid Ground operates the Seattle branch of Penny Harvest.) Also in the report: A new study finds that 90% of youth ages eight to 19 participate in philanthropic efforts. We believe that engaging young people in strengthening their communities is a vital part of ending poverty. Penny Harvest provides young people, their families, and their schools with the tools to take action and create positive social change on the issues they see impacting their communities. To start each year, students collect and gather coins. Student leaders at each school research issues impacting their community, interview organizations working on those issues, and make grants to organizations they see having the greatest impact. Registration is still open for the 13/14 school year! If you are interested in signing up your school, please register at www.pennyharvest.org/SignUp, or email pennyharvestseattle@solid-ground.org for more information. 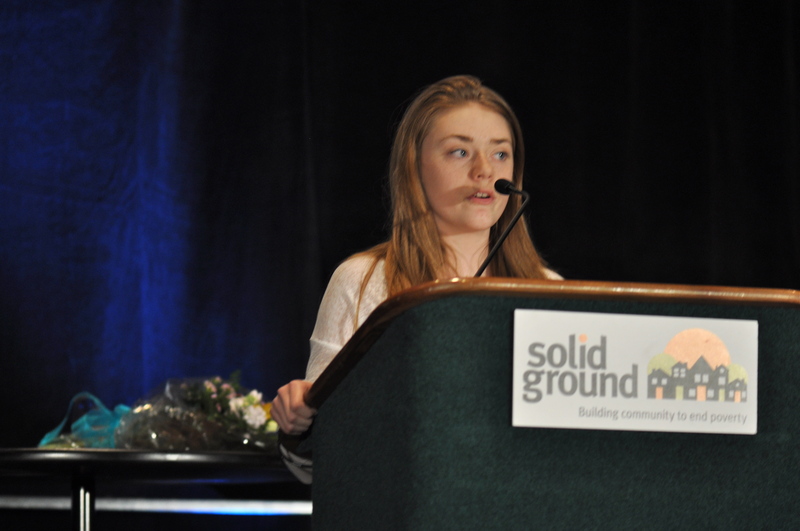 Solid Ground’s September 2012 Groundviews newsletter highlights our Penny Harvest program through the experiences of program alums, and the Big Picture News insert introduces our new leadership. To read past issues of Groundviews, please visit our Publications webpage. Solid Ground’s Penny Harvest doesn’t fit neatly into a thematic box – but this innovative program packs a powerful impact engaging young people (ages four to 18) in philanthropy and service learning. Youth collect tens of thousands of dollars in coins, then carefully review and make grants to causes they care about (such as housing for people experiencing homelessness, cleaning up Puget Sound, promoting animal welfare, and many other efforts). Penny Harvest strives to nurture a new generation of caring and capable young people who strengthen their communities and create personal and social change. With a strong emphasis on social justice, the program gives students of all backgrounds the opportunity to come together and make a difference – creating a generation of leaders who think critically about community issues and take action. To paint a picture of the long-term impact Penny Harvest can have, we spoke to three program alumni who served on a Penny Harvest Youth Board in 2005 – now young adults – to find out what their experiences with the program mean to their lives today. When she first got involved with Penny Harvest, Leah says, “I don’t think I really had an understanding of philanthropy. I did have an understanding of community service,” but she adds, “Mostly I associated community service with something older people did. However she says, “It was through the experience of Penny Harvest that I really understood more about the process of philanthropy – the difference between advantages that I had, and things that I didn’t really have to consider or think about because it was a given for me. What stood out to me then was the social justice aspect of it. For more info on Penny Harvest, visit www.solid-ground.org/Programs/Legal/Penny or contact pennyharvestseattle@solid-ground.org. 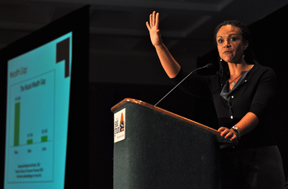 Melissa Harris-Perry presents the keynote address on poverty and racism in the U.S.
You, our fantastic table hosts and guests, raised nearly $200,000 for Solid Ground’s 12th annual Building Community Luncheon! We’d like to thank everyone who made the event a success: our speakers, sponsors, table hosts and guests. It was energizing to come together to celebrate our ongoing work and together move forward. We are finding ways to better integrate our services to be more effective, with the continuous goal of best serving our community. Quinn Smart: How many of you have taken the time to seek out and listen to a child’s opinion on how to be a better philanthropist? Quinn Smart, Penny Harvest Youth Board member, captivated us once again and illustrated how much of an impact one person – one kid – can make, when we work toward a common goal together. Her ask for support definitely inspired our guests. Melissa Harris-Perry’s keynote was riveting. It was hard to fight the urge to take copious notes as she discussed structural racism and how important it is that we all remember that we are connected. Luckily for me (and you), there was no need to take notes, as her full keynote address is available on our YouTube Channel. Most importantly, the Luncheon would not have been possible without the generous support of our sponsors. By underwriting the cost of the event, every dollar raised by our guests can go directly to Solid Ground. Thank you to Microsoft, our Presenting Sponsor this year. We are honored to continue a partnership that has spanned over 15 years. Through significant investments in our programs, housing facilities and IT capacity, Microsoft has helped Solid Ground get more people out of poverty and to a place of thriving. Thank you, also, to our Community Builder and Supporter Sponsors. While the Bill & Melinda Gates Foundation is known worldwide for its philanthropic leadership, on the sleepy western edge of Ballard another institution has developed as a cutting-edge incubator for the next generation of philanthropists. For the last five years, Adams Elementary School has been cultivating young leaders and empowering them to make a difference. 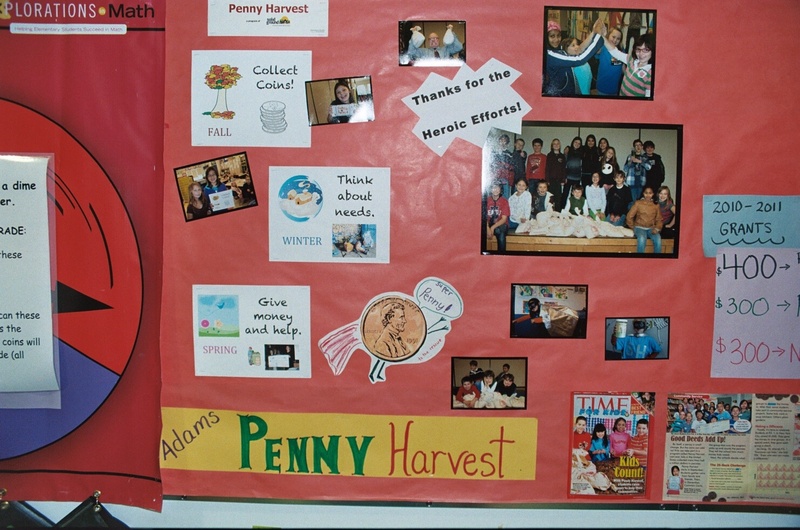 In connection with Solid Ground’s Penny Harvest program, Adams students have raised many thousands of dollars for area nonprofits. In the process, they have created a community culture of engagement. “The whole school really buys into it,” said parent volunteer Bobbi Windus, who has coached the Adams Penny Harvest effort all five years. This year Adams students collected 22 sacks of change, totaling nearly 700 pounds of coins, and a few hundred dollars in paper money. Erica Slotkin volunteered to deliver Adams’ 2011 harvest to the Penny Harvest office earlier this week. 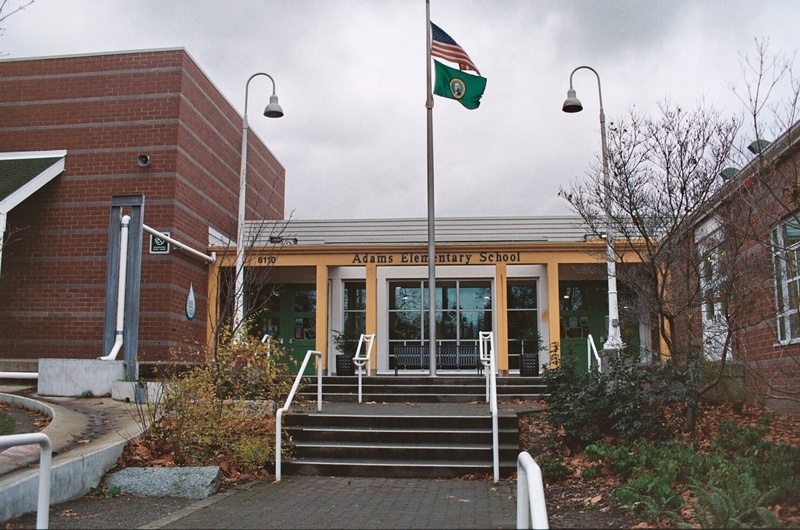 A parent at the school, with a son who is now on the Leadership Roundtable and a daughter whose kindergarten coin collection jar was overflowing, Slotkin also works for Puget Soundkeeper Alliance, an environmental agency that has received support from the Adams Penny Harvest. The Roundtable is each school’s leadership group. They promote the coin harvest, assess what issues students are concerned about, and make granting decisions with money allocated to them by Penny Harvest. Every student at Adams participates in identifying issues by writing or drawing on Caring Cards that the Roundtable groups by theme. The cards are displayed in the school cafeteria. This democratic process gives them guidance in their research of area nonprofits. 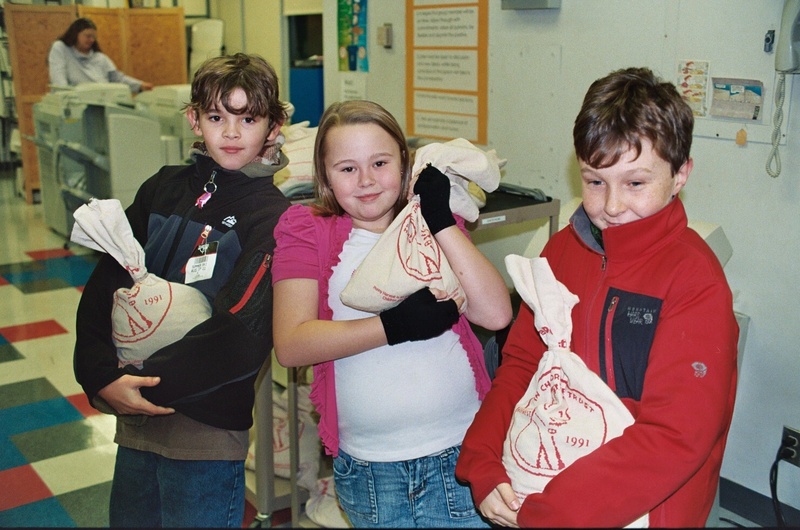 In 2010 Adams granted $1,000, which was distributed among Puget Soundkeeper Alliance, PAWS and New Beginnings shelter. In addition to allocating grants, the Roundtable coordinates community service projects, such as a food drive to benefit the Ballard Food Bank, or a toy drive to benefit Treehouse. Adams students also make an annual video project to promote the Penny Harvest. This year’s video features Abe the Penny looking for ways to be helpful around the school. Previous videos have spoofed Star Wars and taken other lighthearted approaches to promoting philanthropy. “It’s really become a deep part of our culture,” Windus said. We’ll also have moving testimony from folks who have made the transition from homelessness back to solid ground, a captivating keynote speech from Dan Savage about the It Gets Better Project, and 800 folks who, like you, think that building community to end poverty is not just a good excuse for lunching together, it’s what we do. Every day. There are still seats available, tables to host and sponsorships to buy. Email meganl@solid-ground.org to get involved. 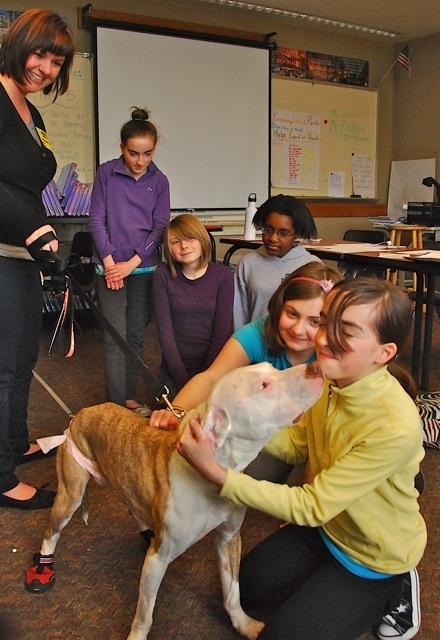 Anna Zuckerman in yellow got a doggy kiss from Miss Floppy as her fellow Penny Harvest panel members looked on. From left they are Leah Zuckerman, Selma Taber, Amy Ijeoma and Chloe Denelsbeck. Miss Floppy's owner and President of AARF (Animal Aid and Rescue Foundation) at far left is Heather Enajibi. Photo by Patrick Robinson, used by permission of the West Seattle Herald. As I sat in Room 307 at Madison Middle School yesterday, I was reminded once again why I love my job. The Penny Harvest youth philanthropy roundtable that aptly named themselves “How to be Awesome” were interviewing organizations that they were considering granting funds. The questions they asked “were probing and pointed and the answers provided real insights into both the spectrum and depth of their need,” according to a write up about the group in the West Seattle Herald. I found myself uplifted by the fact that I was sitting in a room with six young people in 5th through 8th grade, and they were having open and honest conversations with adults about real life issues that our communities face every day: child abuse, homophobia, suicide, homelessness, mental illness, animal abuse. Here’s the best part: Not only were they engaged in dialogue, but they were deciding what they can do about it…and adults were coming to young people for help to figure it out! Real change happens when we engage all parts of our community in problem solving, and young people are critical partners in creating change. These students are doing just as they named themselves, teaching the world “how to be awesome.” Thank you Madison Middle school student leaders. Editor’s note: If you are interested in supporting Penny Harvest, or want to learn more about the program, email Mike Beebe: mikebe@solid-ground.org.